1. Hydrocollision pumps. Function without foreign energy, using energy of hydroblow of the water flow moving in the pipeline. Height of rise is from 5 to 50 m and more. The large modifications allowing to irrigate with one pump from 10 to 30 hectares are developed. Gidrotaran's appointment: Rising of water for an irrigation of sublime sites of bogarny lands, filling of pools and tanks, creation of pressure in a pipeline network at the round-the-clock functioning. Potrebiteli:fermersky and country farms, livestock complexes, construction objects, fisheries, aquaparks and homestead farms. At the same time, capital disposable investments make 500 - 800 US dollars on 1 hectare (without the cost of an irrigation network), and further operational costs are practically absent. The water pump "Gidrotaran" is environmentally friendly, is not critical to influence of the carrying and weighed deposits, such as sand, gravel, floating objects. The hydroram is calculated on the long round-the-clock work which is not demanding special service throughout all resource. Pump service life – 20 years. The prices from 360 dollars. 2. 3 and 5 kilowatts hydropulse micro hydroelectric power station. The rural consumers living near small waterways will receive a reliable and readily available source of the electric power. Exist small and micro - the hydroelectric power stations of individual use calculated on one or several isolated farms which are let out abroad. Their principle is based on a traditional way of creation of a static working pressure and falling of water on the turbine blade. The working pressure demands application of micro hydroelectric power station, generally in the conditions of the mountain district and creation of hydraulic engineering constructions of considerable parameters that increases prime cost of the developed electric power. 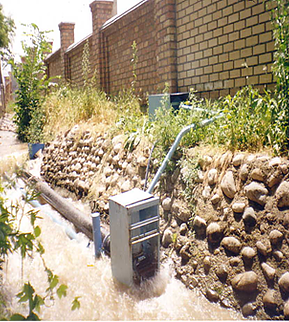 In a new hydropulse way parameters of the hydraulic engineering construction on height are reduced by 3-4 times, operation on the river streams bearing abundance of carrying deposits, gravel and sand becomes simpler.